Among my people, the spider is a sacred creature and is characterized many ways depending on tribe. 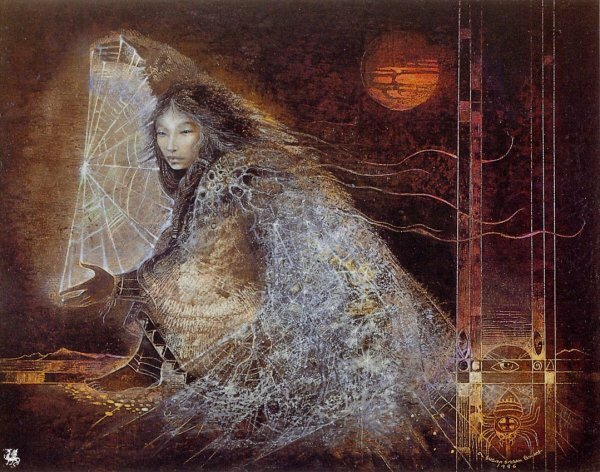 Some believe the spider is Grandmother, a female deity who is powerful, enables growth, makes medicine and can be both benevolent or a trickster. Others call the spider Grandfather. Though some tribes believe it is proper to kill one in a certain way, but among the Apache it’s considered bad luck to kill a spider or break a web, as Grandmother Spider wove the web of the world, and we should not unmake it. One may go out of one’s way to avoid doing any harm to them and their environment. I have always been cautious with spiders, not alone because I come from a part of North America where there are several deadly varieties, besides a whole range of snakes and other such creatures. The other reason is rather irrational, and based on events experienced as a child. I am a person who, if forced to be inside, am usually looking out of the window. In one place I lived it seemed like every time I went to look out of my bedroom window, I could see the outside through the sheers, but once I focused up close: there was a big spider right in my face. Rather about the same time, my mother bought me a gray blanket with black snowflakes on it. I especially liked it because it was the first just for me alone, and it was very soft. However, one night I woke from a bad dream and look down to where it covered me, and in the low light, it looked like my bed was covered with large, black tarantulas. Leaping up, I tossed it away and never slept with it again. Once, in Berlin, at a flat in which I rented a room on the ground level floor, which had a nice view of the courtyard garden with its tall, very old trees, I came home to find a large spider on the window sill. I went cold all over. I would never kill a spider, and in fact, I do not kill any insects if at all possible, no matter how annoying they might be, so I didn’t quite know what to do. When I forced myself to walk closer, I saw the spider sat on a good-sized pile of eggs. No way. No way in hell was I going to be able to stay in that room. I asked the guy I rented from to please remove it, and though he good-naturedly mocked my angst, I didn’t care. So he gently picked up the spider and put it outside the window, but the next day it was back. The day following I moved out. It’s so ironic that later, in the house I lived at in Bad Saarow-Pieskow, which I so love, is a spider magnet. It is absolutely filled with spiders. Spiders are also considered by some as drawing good fortune to a home, and that it means prosperity. Well, then that house must be very rich indeed, and I believe it is, in positive spiritual energy. There I learned balance and peace within myself for a time, by observing the spiders. There are two distinct types of spiders in the Bad Saarow house: the spindly legged ones called “Granddaddy Long-Legs” in some places in the U.S., then a very large kind that look like they may belong in a desert setting for they are spotted brown, tan and yellow. They give me the creeps, seriously, though my son loved them and would draw them or pick them up. The “spindlies” I don’t mind, and in my room, there was one in each corner. I appreciated their presence as they helped keep the gnat and mosquito population moderate. They also calmed me, for laying and watching their motionlessness, their balance and quietness made me quiet. I mentioned this to my friend who was delighted with the idea, and she also began to “watch” spiders for meditation. Except for one variety found deep in forests, there are no poisonous spiders in Germany, and I hadn’t forgotten this contrast to the varieties of Alabama when I returned to my parent’s home stateside. They live in a rather rural area neighborhood with a river right at their back door. I didn’t know what had bitten me at the time, but one “kissed” me just behind my right ear one early morning as I slept, and I awakened immediately from the pain. Once I was up I saw a small Black Widow, one of the deadliest kind there is, near the baseboard of the wall next to my bed, and I suspected it had given me my “kiss.” As I began to feel poorly, at the suggestion of my mother, I took an over-the-counter Zyrtec. I’m allergic to shellfish. Though I sometimes had to prepare them for my client when I was a private chef, I had to be very careful. I’m allergic to the degree that sometimes just smelling it can give me a reaction: a throat that feels like its closing, a headache. Once when shelling a lobster my hand slipped and a piece of shell pierced beneath one of my fingernails. I had to immediately take an anti-reactive and felt ill for days after. Anyway, I usually avoid medication, and doctors and anything related to doctor’s offices and hospitals whatever is going on with me but this worked against me in this instance. I went to work that day, in my capacity as private chef, and I made it through the few hours preparing an uncharacteristically simple meal (my client preferred French and complex). I took a 2nd tablet once I got home and went to bed, for my headache was growing along with the pain at the site. By the next I was willing to take an analgesic, something I also normally refuse to take. Nausea began, light-headedness, the headache became a migraine. Again I went to work, and barely made it home, falling into dark dreams though my heart felt like it was racing. The third day. I felt like I was listing to the right, the headache on that side…my vision started going in that eye, and what I could see with the left was skewed; the light too bright. Things were moving, almost spinning even when nothing was supposed to be. I slowly, grimly dressed for work. I thought just a little while longer and the worst would be over, after whatever it was in my system got out. Yes, I suspected the spider, but didn’t want to go to a doctor and it turn out to be something else, something that just needed time to pass. I was almost out of time and didn’t know it, but on the way to work I made a choice that saved my life. After I pulled into the parking lot of a “doc in the box”, an independent doctor’s office specializing in “walk-ins”, each step was pure determination. The world was tilted, the vision in my right eye was completely gone, I could barely speak when they asked my name and reason I was there. My heart felt like it was going to jump out of my chest. When they called me back, a nurse took my blood pressure and looked at me in alarm. “Blood pressure problems before?” she asked, eyes wide. “Never, it’s usually quite low,” my voice was slurred, strange to my hearing. Consciousness was fading in and out. The view had taken on strange colors. She hurried out the door and came back with the doctor. My blood pressure was 240/174. Massive heart attack or stroke range. They administered injections immediately, rung for the ambulance and I was transported to a main hospital. I don’t even remember that last part. The next I knew it was a few days later. They told me if I hadn’t taken the first Zyrtec pills, and later came in, I would have died within a few hours. It’s not the venom that directly kills you, it’s what it does to your organs. My kidneys and liver would soon completely throw off the poison, and their functions hadn’t failed, but my heart was the problem. Having been born with an inherited disorder anyway, though it is a fairly common one and had never impended me from any activity and as you can read in my intro, I was a law enforcement officer for years, with all the strenuous activity that involved, so it hadn’t kept me from doing anything. For a quite healthy person who was rarely ill even with a common cold, now, overtaxed and strained, my heart was now seriously damaged, and my health became troubled. Coincidentally, this was a month before my first story, “A Lieutenant’s Love” was released June 2010. Just two weeks after it was out I was back in the hospital with my first heart attack. I spent Father’s Day there. Six months later in December, shortly after I released my first independent title, “Katrdeshtr’s Redemption”, I was back in again for my second attack. Christmas “inside,” as it were. Despite it all, or perhaps because of it, my desire to return to Germany became stronger, through it was harder and harder even to walk to the mailbox, and I could feel my body weakening, my strength fading. I might never have made the move permanently, maybe this was the spider as spiritual figure’s redirection of my life, but I decided to do so. I made the move in 2011, and it was great to be back, and my son had come with me to help, and as he loves Germany too, but there was still hard times to come. It had never happened in my life, but my reflexes and instincts weren’t the same. I was robbed after arriving while on the way to make payment for renting a flat. A great deal of money was lost, and with part of what I had left I decided to send my son back to the U.S. with my parents. A good thing, for after an unscrupulous renter wrongly used my flat deposit and legal recourse would have been even more money I didn’t have, only some months later I found myself homeless and had to live when and where I could for several weeks, “squatting” with others down on their luck. As in so many cases, the situation broke down further the needed and long maintained barriers within myself. Though I had been writing and looking for other work, the strain and stress of being virtually penniless, with barely enough to eat, the mentally and psychological “self-kicks” for being so stupid…began to overcome my control over my memories of sexual and physical abuse and violence I suffered growing up. I had been working on my memoir of those times and how it had affected me my whole life for over a year, but as stated in my entry, “Unfinished Sequels: Why? Simple Answer: Reality”, I found I had to put all other projects on hold to address my personal agony through completing, my memoir. A true conundrum. I had many lucrative projects planned but I couldn’t write on them. I had to free my own soul first. I could have gone to friends, but like anyone might, I was angry with myself and felt this was what I deserved, another aftereffect many abuse survivors have to fight: self-recrimination and the welcome of discomfort and pain. My health further deteriorated and by December 2, the final big attack hit. I survived, but was told if I didn’t have surgery to replace necessary parts within my heart, I might only have a few months to live. Within days I was under the knife. So I had a place to stay for a while: the hospital and spent Christmas 2011 “inside” again. When I was released, I was fortunate some money I had applied for came through and I was able to find a room to go to. You look young enough, hail enough, but since I lived alone I had to go out anyway, despite my lengthy incision that still had seepage if I did too much activity. A walk that takes me 15 minutes now, took me an hour or more then, just to creep to the store for something to eat, necessarily light in weight because I couldn’t carry much any more. And then the hour long trip back to my room. People looked at you strangely, maybe thinking you a drug addict or mentally deficit, for why did someone who look young and hail enough have to walk so slowly and carefully? The majority of all days was spent laying down. Yes, I would sit up to interact online each day or every few days, but healing was primary. Necessary. Since the operation, I realize now how very badly I’d felt for so long. I could literally feel my strength return day-by-day, though still now, if I do too much I can have great pain and have to spend days “down again, yet my emotional pain has deepened. Being separated from my son is hard, as is being away from my People, although I feel most comfortable in Germany unless I am directly among them. Not to mention the continued financial pressure, the increased university coursework, and being able to complete projects. The life is a writer isn’t as easy as some might think. Many have other main jobs to support themselves, but in that I continue unemployed though I search as I can. I continue to go to university and hopefully one day will work as a mental health care professional. I have to continue to write because my spirit needs this release, but when you receive hundreds of rejections for every one acceptance or you have people that read your work and treat you and it dismissively? Or you have to wait months just to be told “no” anyway? These are all part of the natural process of a writer’s life, and we persevere but there are times it can and does get to you more than others. When you have groups or certain people also attacking you based on lies and assumptions, giving you casual cruelty for no reason you can ascertain except they wish to believe the lies about you for their own agenda? I have enough to deal with without these thoughtless, “faceless” attacks from those who forget or do not care that you are a person, too. It culminated last week when a moderator on a Goodreads group posted a negative message about me, and then their “supporters” subjected me and my work to cyber attacks whose pettiness and nastiness almost defied description. I posted a public statement in response to that (last entry), trying to bring closure for myself, to give a response to and end their “campaign” against me. Then something new developed. Later that night I had my first Transient Ischemic Attack. That is a mild stroke. 1 in 3 people later go on to have a massive stroke. Posted in Personal Entries, Writing and Writers. Tagged life, native american mythology, personal stories, spiders, survivor stories, writers, writing. Next: Next post: Homo-Ignorance: Are You Part of the Problem? I’m sorry to hear all this, I knew you had health problems but I didn’t know they were like this. How you have dealt with life’s challenges thus far is testament to your strength and spirit. Be well soon! Thank you, Nancy. I appreciate your taking the time to read and comments. It means a lot to me. This is such a powerful entry, so many challenges and transformations. I send you my best and a song of healing. Please take care and be well! There are so many doors that open and close in our lives. Grandmother opened a door for you, and as is so often the case, changed your life. I don’t know how to think about this exactly, only that these doors open and we find ourselves in another life. I do know the journey is often challenging and painful. I guess one benefits from resisting the urge to name it “good” or “bad”. The Grandmothers and Grandfathers don’t seem to see it that way. Maybe that way of seeing is a human way. Thanks for letting us share a bit of your journey. Indeed, time will only tell, and maybe not even then. It’s the journey for me, and learning necessary things along the way or remembering what I have forgotten. I quite believe also the labeling of “good” or “bad” to some event or occurrence can hinder the growth we may have from it. nice to read you, and thanks. For obvious reasons your post jogged a memory for me: I must have been five or six years old and living in Texas. I was riding my trike around the house, when I looked down and saw a black widow walking on the handle bars. I don’t remember what happened next…. It’s so amazing sometimes how life goes, the things we remember or do not, and may learn what it means. Or may not. Til we go to the other world and meet with the Grandmothers. Indeed, for every “may” there is a “may not” naturally, even if unspoken.